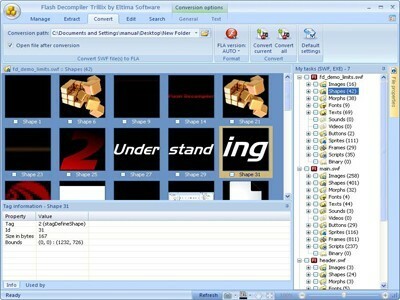 SWF to FLA Converter is an advanced solution for all Flash developers and novices that easily converts SWF files into their source code FLA, extracts SWF elements to various formats and allows editing SWF without converting it into FLA.
SWF to FLA Converter is an ultimate utility for every Flash designer, web programmer and just everybody, whose work or hobby is connected with Flash technology. SWF to FLA Converter lets you convert SWF into its source code FLA or Flex project files (if it was created there) within a couple of seconds. It offers multi-window interface for simultaneous work with SWF files and comparison of results and unique Dump Viewer for viewing the detailed tag structure of a SWF file. It supports batch files conversion, so you can load several SWF files, press Convert button and just sit back and enjoy the results.